Flag-draped caskets of the 42 out of the 44 slain Special Action Force members were transported to Manila’s Villamor Air Base on Jan. 29. Photo from the PNP-PIO Facebook Page. Full credit goes to President BS Aquino for uniting the nation twice this week, but for the wrong reasons: First, in grief over the loss of 44 members of the elite Special Action Force (SAF) in a bloody operation he approved; and second, in fury, over the chief executive’s snubbing of the arrival honors at Villamor Air Base for the fallen elite cops. Aquino waited for three days before he decided to address the nation in a speech described as so important, it had to happen at exactly the primetime 6:30 pm timeslot on Wednesday. But not a few yawned over Aquino’s long-and-winding speech. Too much noise, too little sense. Too many details, too little insights. Many were disappointed that Aquino did not say anything consequential about the incident. No admission of command responsibility. No explanation as to why he was in Zamboanga last Jan. 25 where was supposedly ready to present big news at a press briefing that was later scuttled. No explanation why the police chief suspended over graft charges was involved in the planning and implementation of the operations. No explanation why US troops knew more than the interior secretary and the acting police chief. Nothing meaningful to commiserate with families orphaned of their sons or fathers. Nothing definite as to the state obligations to the dead. Nothing profound to unite the nation, except a National Day of Mourning. The realization is that our nation’s cops and soldiers serve under leaders who are totally undeserving of even one drop of their blood. The 44 were sent out to be slaughtered, according to the CPP. Aquino even had the gall to pass on directly to citizens the task of helping the families of the 44 fallen SAF members. Donate to them, Aquino said. As to how quickly the same families would receive the state’s obligations of assistance, he didn’t say. Where’s the President? He wasn’t here. Photo from PNP-PIO Facebook Page. 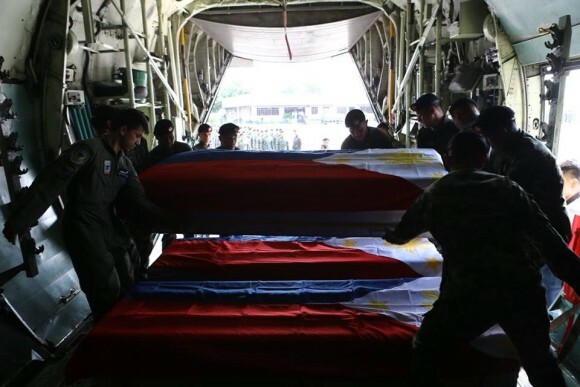 Amid the sense of grief and a day before the National Day of Mourning he proclaimed, Aquino did the unthinkable: He snubbed the arrival honors for the dead SAF members. Friends were quick to tell me that “what to do next” supposedly did not need any explanation for any person. But in this case, the collective brain trust of the BS Aquino presidency, including Aquino himself, failed to fathom the meaning of the post he occupies and the responsibilities that go with it. The President did not skip the arrival honors today (Thursday), it presupposes he was originally scheduled to attend it, which was not the case. 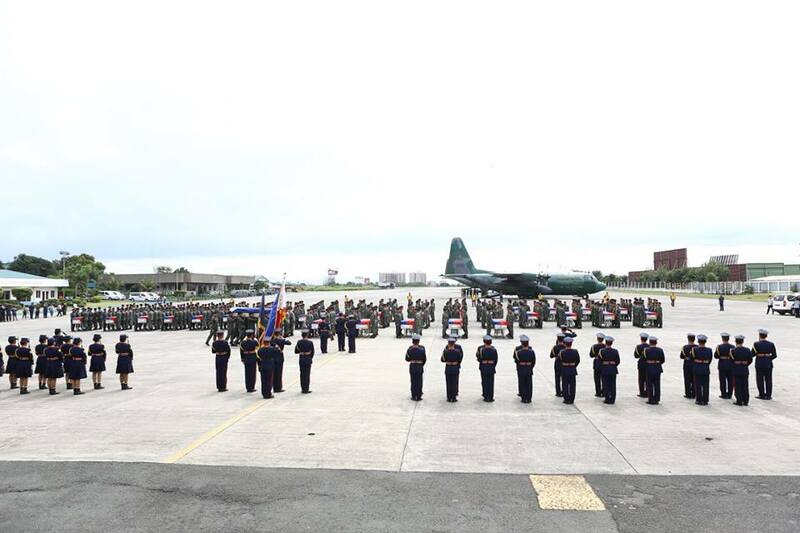 There you have it: Aquino and his minions did not even consider to attend the arrival honors. And so the person who holds the peerless titles of President, Head of State, Head of Government, Commander-in-Chief and — according to himself in his primetime speech, Ama ng Bayan — did not see anything wrong or objectionable in his schedule for January 29. He willingly and defiantly decided to attend the inauguration of a car manufacturing plant at the same time that the bodies of 42 out of the 44 fallen SAF members were due to be given arrival honors at Villamor. The question “Nasaan ang Pangulo?” and its incarnation as hashtag burned the Philippines’ internet all day long and into the night. Celebrities and parody accounts, political junkies and journalists, activists and relatives of cops and soldiers, young and old, rich and poor, united and asked the simplest yet toughest question that all the “matatalino” at the Palace failed to answer. Aquino and his minions proved yet again their intellectual and emotional deficit. #NasaanAngPangulo wasn’t about Aquino choosing to check out cars. It was about the President refusing to do his duty as Commander-in-Chief to honor the cops he sent to harm’s way. It was about the absence of the President, Head of State, Head of Government, Commander-in-Chief and self-styled Ama ng Bayan. And so the Philippines transforms its grief over a terrible loss, to fury over the most irresponsible president and his cohorts. Who’s afraid of a PNoy resignation?